1 spoon of vegetable or olive oil. Using the egg cooker or small pot with a boiling water, soft-boil eggs to keep the whites firm and yolks semi-liquid. Shock in cold water to stop the cooking process, peel and slice in each in half. You might marinade egg in soy sauce and other condiments, but it requires more time upfront. Clean and peel carrot, and daikon (or white) radish, then slice green beans into large pieces and chop spring onion into thin slices or bits. Slice the daikon radish into long stripes, and using the vegetable peeler slice carrot into paper-thin slices for garnishing. Dissolve bonito dashi (fish stock) in the pot of boiling water, add oil, and place daikon radish slices. Add soy sauce, herbs, and adjust with pepper, salt and other spices to your taste. Cook until boiling pot, then take off the heat entirely, add herbs, and cover. Place ramen noodles into another pot with boiling water (any volume that suits the noodle amount), add some salt and cook the ramen for 3-5 minutes until cooked. Pour through a colander and immediately pour back into the soup. Set the soup pot on a high heat to reach the boiling point as fast as possible, and place green beans in the hot soup. 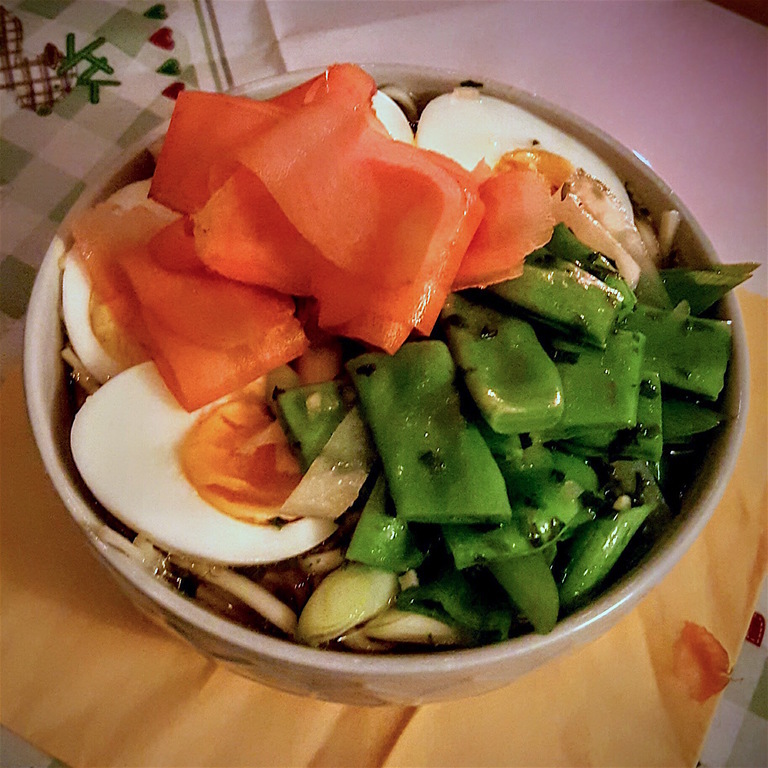 When the soup is boiling again, place each noodle portion into a ramen bowl, then arrange toppings nicely: place some cooked radish on the noodles, sprinkle with chopped spring onions, place eggs on the side, and cooked green beans in the middle, pour piping hot soup over the toppings, and garnish with little nests made with paper-thin carrot slices. Serve immediately with chopsticks for ramen and spoon for the liquid — toppings blanched with hot soup will be easy to pick up and crunchy!